Silverdale’s Monday morning Fitness League class recently celebrated their 33rd birthday on the 29th October. The original teacher, Jill Nutsford, was with us, and long term attendance certificates were given to Elsie Nichols, Pam Long, and Muriel Shepherd, who unfortunately was unable to be with us. 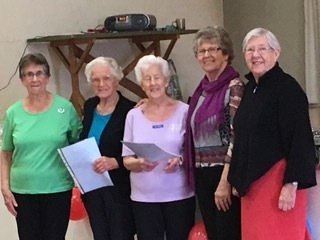 From the left of the photograph, is the current Teacher, Olive Morrison, long term members Pam Long, and Elsie Nichols, Jill Nutsford, and an early member, Elizabeth Hartwell, who is now a retired Teacher. Approximately 60 members attended the morning class, with various teachers taking part of the class. 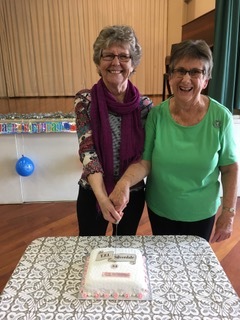 Celebration cake with Olive Morrision and Jill Nutsford doing the honours.